I have worked from home for many years and really appreciate the benefits of doing so. I have done the “office” thing and am grateful not to be doing it any more! My office is one area I spend many hours each week working, this is my main work area and recently underwent a refit when I had a huge new desk installed. The previous desk wasn’t small by any means but as the list of tech I use on a regular basis grows so does the need for space to accommodate it all. 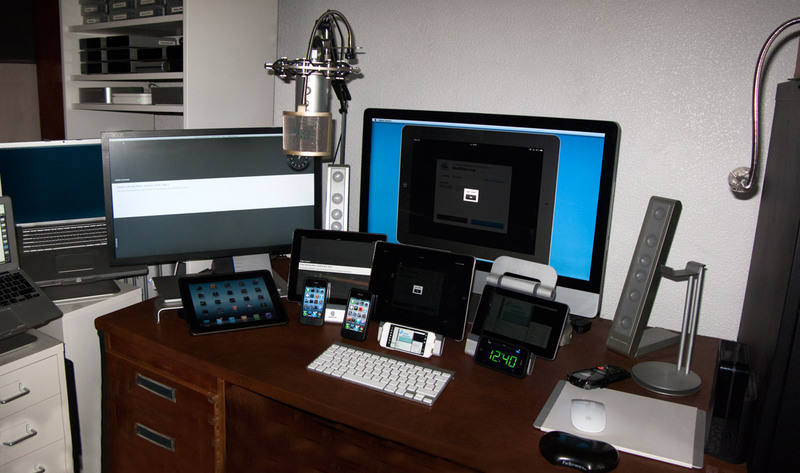 Having said that I do try to keep the tech on the desk permanently to a minimum as you can see. If you’re wondering what I do with all that lovely space … this is what I was trying to avoid! Yes, that was the original desk during a live session delivered in June 2013. That was when I decided I needed to get a bigger desk! The iMac is a late 2013, 3.5GHz Intel Core i7 with 32 GB RAM, 1TB SSD and NVIDIA GeForce GTX 780M 4096 MB graphics card. 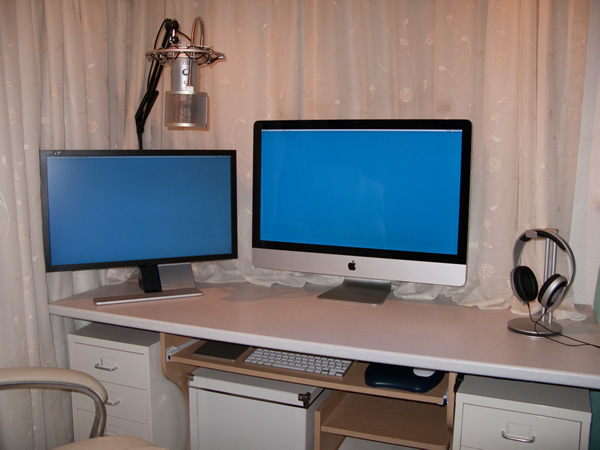 The two external monitors are Acer 24″ models attached via the two Thunderbolt ports on the iMac. My keyboard is a throw-back to days when keyboards weighed more than a Frisbee and made enough noise to annoy an entire office full of colleagues. Luckily I work alone and I love my Matias Tactile Pro keyboard. I will admit though it has to give way to a Logitech K811 during my live sessions lest I deafen the attendees! Another area where I spend many hours each week is my studio! This is my recording studio which is soundproofed with only absolutely essential equipment to ensure it remains a quiet room for recording training videos, doing voice work, podcasting, virtual training and presenting webinars. This combination allows for screen recording at a wide range of resolutions, even more so when used in conjunction with resolution switching software. The microphone arm lifts the microphone off the desk which reduces the pick up of interference from the rest of the equipment and the inevitable vibrational hum from the desktop. The microphone is attached to the arm via a Blue Radius Shock Mount and has a Blue Pop Filter attached. There is a powered 8-port USB2 hub connected to the iMac for the painless addition of any additional required devices. I’ve installed a dedicated switch for connectivity, wireless alone is of course not advisable when using any kind of webinar delivery platform. The switch is cabled to the rest of the network and means additional equipment can be added as required without running extra cables. 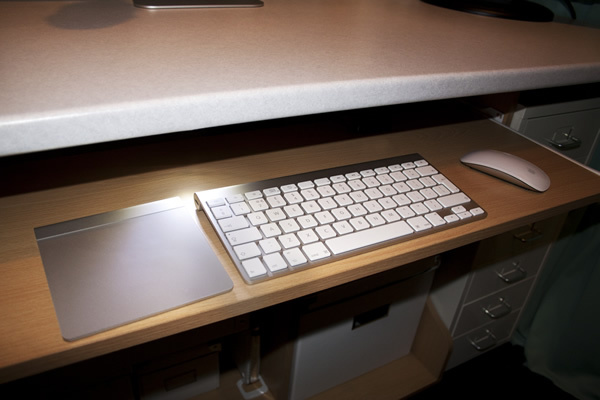 Input-wise I use an Apple Wireless Keyboard, an Apple Magic Trackpad and an Apple Magic Mouse. The biggest benefit of these is that they are completely silent in operation, especially so as they are situated under the desktop. The desktop is manufactured from acoustic insulation board too so noises above and below are not transmitted through it. There is integrated lighting built-in under the desktop, particularly handy for those late night Pacific time zone based webinars! Headphones are also a necessity and mine are from the Sennheiser Professional range, HD 212 Pro, closed back with good insulation to prevent sound escaping from them. The remaining functionality I need is provided virtually. All necessary mixing is done via software based mixing applications. The audio capture is done via two applications which together provide an unlimited multichannel recording suite and I have soundboard software linked to the broadcasting channels for live effects etc. As I said the room is soundproofed and is quad-glazed (double, double glazing if you will!) – it’s actually 4 separately insulated glass units which reduce extraneous noise to virtually zero. The cream fabric is covering acoustic foam lining the walls, again to minimise sound reflections and external noise. As there’s nothing worse than losing connectivity during a virtual session I have 2 high speed ADSL lines simultaneously connected for redundancy. These can be immediately switched between being the primary and secondary connection. I also have an 8GB 3G wireless connection via a Novatel 2352 as an additional backup. Finally there is the oft overlooked essential of any office – the comfy chair!